This is an attempted port of fox flux, to Rust, running on the Game Boy Advance. You will need a GBA emulator, of course. I've been using mGBA 0.7, and can't guarantee it will work with other emulators (or even on hardware), but there's no reason it shouldn't. Probably. Fate unknown! May or may not continue working on this. You can move and jump. 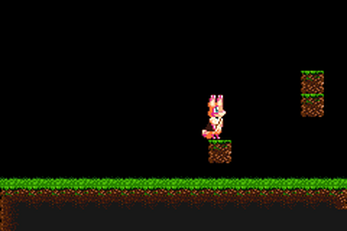 There is a block, which you can jump onto. If you go too far in any direction, the game crashes (i.e., freezes). The game is currently SFW, but that is highly likely to change if I keep working on it.